"George Romanta Kinney was born at Candor, New York, June 5, 1866, a son of Jeremiah S. and Mary Louise (Woodford) Kinney." and "George Romanta Kinney, president and treasurer of the George R. Kinney Company, the largest retail shoe enterprise in the world, passed away June 17, 1919" (American Biography; A New Cyclopedia, Volume 6, Published under the Direction of The American Historical Society, Inc., New York, 1919). A history of Kinney Shoes is found at http://www.web-design-michigan.com including, "In 1894, an ambitious young man named George Romanta Kinney revolutionized footwear retailing by offering popularly priced shoes to working Americans. One hundred years later, the Kinney Shoe Corporation was the nation's largest and most powerful footwear retailer. George Kinney's father ran a general store in Candor, a country town in upstate New York. Having provided merchandise on credit to local farmers and townspeople once too often, Jeremiah Kinney fell into debt. Upon his untimely death, his son, George, then nine years old, vowed that he would pay off his father's bankruptcy debts as soon as he finished school. At the age of 17 in 1883, George left his widowed mother and his sister behind in Candor and went to work in Binghamton, New York, for Stone, Goff and Company, a large manufacturer and wholesaler of boots and shoes. Business was 'dull,' he wrote his family in 1885, and in that year he moved to the Lestershire Boot and Shoe Manufacturing Company, then the largest footwear manufacturer in upstate New York. During his ten years as a clerk at the 'Lester Shoe Company,' as it was commonly known, Kinney acquired a thorough knowledge of the shoe business, helped support his family back in Candor, and paid off his father's debts." On Kinney's death in 1919 the following appeared in the Press and Sun-Bulletin (Binghamton, New York), 18 June 1919, pg. 3, "Word was received here today of the death of George R. Kinney, chain shoe store magnate, at his home, 701 East 17th street, Brooklyn, yesterday, following an attack of pneumonia with which he was stricken early this week. Mr. Kinney, for many years, was engaged in the retail shoe business in this city. He originally came here from Candor and was employed for a number of years by the Lester Shoe Co. He later conceived the chain store idea and opened his first store in Binghamton. The store was a success. He later opened others in surrounding cities. At the present time the corporation which he formed and of which he was at the head, controls sixty retail stores in different parts of the United States. The big shoe store at 43 Chenango street is one of the Kinney system. Mr. Kinney left Binghamton about fifteen years ago, after approximately half of his present stores were started. He chose Brooklyn as his home because it was the nearest city in the central point of his mammoth retail chain store system. He has been a frequent visitor in Binghamton since and usually spent much time here with his family in the Summer visiting various relatives who reside here. George E. Hatfield, manager of the Binghamton store, received a telegram from the Kinney Co. offices today instructing him to close the store tomorrow out of respect for the former head of the concern. The funeral will be held tomorrow in Brooklyn. The body probably will be taken to Candor for burial. Besides his wife, Mr. Kinney is survived by two sons, both residents of Brooklyn and a sister, Mrs. Edward G. Woodford, of Candor." A similar obituary appeared in the Brooklyn Daily Eagle 18 June 1919, pg. 18, reading, "George Romanta Kinney, 53 years old, founder, president and treasurer of the shoe firm of G. R. Kinney Co., died yesterday at his residence, 701 East 17th st., Flatbush. His funeral services will be held there tomorrow evening at 6:30 o'clock, and the interment will be at Candor, N. Y., Mr. Kinney's birthplace. Mr. Kinney is survived by his wife, Mrs. Elle M. Kinney; two sons, Leroy Kinney of Brooklyn, and Charles W. Kinney of Plainfield, N. J., and a sister, Mrs. Minnie Woodford of Candor, N. Y. Mr. Kinney was one of the first employers in this country to divide the profits of his business liberally with his employees, and to this feature was largely due the rapid expansion of the largest, exclusive retailing shoe concern in the world, operating 62 large stores in the principal cities throughout the United States." In 1956 Kinney merged with the Brown Shoe Co. of St. Louis, and then in 1963 the F. W. Woolworth Co. acquired Kinney from Brown. As a subsidiary of Woolworth Kinney was in business until 1998. The first Kinney Shoe store in Petersburg opened in 1935 at 120 N. Sycamore St., and was in business at 8-10 N. Sycamore from 1939 until [when?]. The store was expanded and remodeled in 1954 (Progress-Index, 18 Aug 1954). The latest ad for Kinney in the Progress-Index on Newspapers.com was this one from 1968. 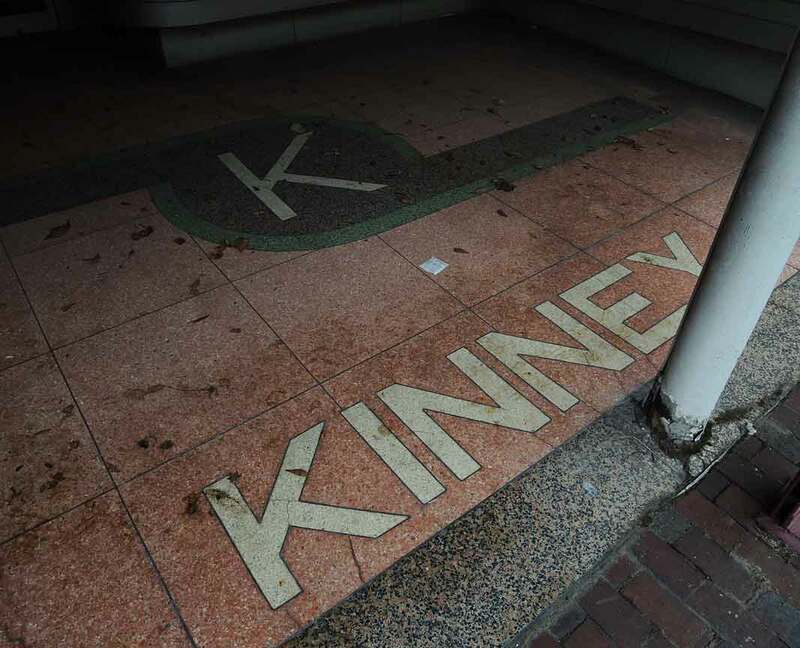 A photograph of the same Kinney sign as above is found on flicker, taken 2008. Another is found on flicker, uploaded 2016.